Endowment effect – We value things that we already own or partially own more than items we don’t own. Laziness – People go for the path of least resistance due to the desire to conserve mental energy. Fear of regret – We dislike the feeling of regret of making a bad decision and will avoid change if we believe we may regret it. Paradox of Choice – In his book of the same name Barry Schwartz argues that due to the sheer amount of choice and the complexity of decisions people often suffer from decision overload which can cause them to freeze and make no choice (i.e. stay with the status quo). Lack of knowledge – Linked to the Paradox of Choice is that people often don’t have the knowledge or expertise to feel confident about making a decision. This is especially the case with complex and infrequent choices such as financial services. Loss aversion – People are generally loss averse and see their current choice as the baseline. They perceive change as a potential loss and so may avoid change to prevent a feeling of loss. Inertia is a powerful force behind procrastination and low levels of brand switching. Free trials, money back guarantees, free after sales service, and free delivery and returns can help customers overcome inertia as they potentially minimise the perceived risk of changing. 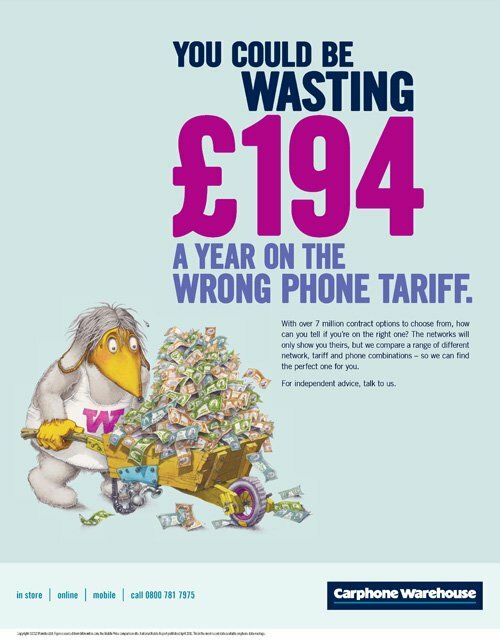 Framing a change as a potential loss (see Carphone Warehouse ad below) can also improve the appeal of an offer as we are more driven by avoiding losses than winning gains.